This is the 1st film in dir. Kieslowski’s Three Colors trilogy. The blue represents depression, sadness, and freedom here. 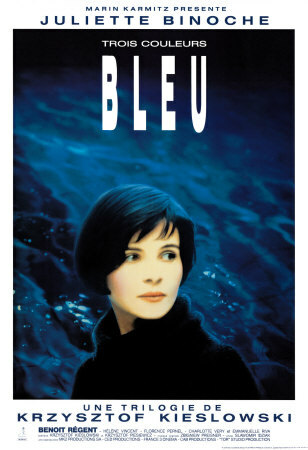 Julie (Juliette Binoche) is a young French wife who loses her husband (a famous composer) and 5 y.o. daughter in a terrible car crash at the opening of the film. She decides to leave her large country estate, taking nothing except a gorgeous blue mobile ornament, and move to Paris to live a solitary life. She’s determined that she won’t work, seek out company, or reconnect w/ the family friend who may have deep feelings for her. But life has a way of just happening, even as Julie is in deep mourning. In her apt, Julie is deeply perturbed by a mouse and her babies in one of the closets. Even a mouse can have babies, while she has lost everything! Then a young single woman from downstairs barges in on Julie. She looks like she can use some comfort, and Julie is around (w/ a non-judgmental attitude). Eventually, Julie starts to finish the song that her hubby left behind. This is a non-narrative, artisitic film, so it won’t appeal to some viewers. It’s slow and contemplative. The music is simply beautiful. There are many close-ups of Binoche’s (I think perfect) face as she goes through a myriad of emotions. Binoche is simply great (and I wouldn’t expect anything less). You can’t see her acting; everything just rises from within. Vive La Binoche! NOTE: There are 2 versions of this film, one of which is R-rated, and was shown in indie theaters upon release. The version on Netflix is the original Unrated film(equivalent to MPAA’s NC-17 rating). This is another film that’s not for everyone, BUT it certainly is unusual and out-of-the-box. (NOTE: There is an R-rated version and an Unrated version.) Raw emotions are depicted, as two strangers connect to and disconnect from each other in London. It was directed by Frenchman Chereau and stars British character actors from the theater. The film is based on a short story by famed British-Pakistani writer, Hanif Kureishi. This is the kind of stuff Hollywood is afraid to show! Jay (Mark Rylance) is a failed musician who manages a trendy bar and lives in a dump of a rowhouse in a working-class area. In his past life, he was married and father to two adorable young sons. For a personal life, he has a (junkie) best friend and Claire (Kerry Fox). But Claire is NOT his gf or a “friend w/ benefits”- she’s a stranger who comes by once a week for hooking up. Jay and Claire barely speak, but one day, Jay follows Claire out into the streets, curious about her “real” life. That’s when the story gets GOOD, and even a BIT suspenseful! Jay is shocked to discover that Claire has a full life; she’s an amateur actress, drama teacher, wife, and mother to a preteen son. He even talks w/ her husband, Andy (Timothy Spall), a talkative/humble cabbie who doesn’t know much about the theater, but supports his wife (in the background). You can see the shock/pain/jealousy on Rylance’s face as his character wonders why Claire gets to have a life while he’s in a fog of depression, missing his ex and (especially) sons. When Jay confronts her about it, Claire feels VERY violated. She lashes out at him- he wasn’t supposed to enter her life like THAT! But Jay CHOSE to leave his family, and now he can’t handle it. The new bartender working below Jay, a cute young Frenchman, wonders if Jay can even feel love. Ouch! The streets are gritty and unwelcoming. There are people everywhere, but the main characters are drifting, lost in their own world of disappointments, compromises, etc. Jay and Claire are BOTH artistic souls, BUT they have failed (or not made much of a mark) in that regard. Andy seems like a decent guy; Claire is a mystery- I found her to be TOO abrasive. I’m pretty sure that was intentional. Jay is the more sympathetic individual (though very flawed); more is seen from his view. In one quiet scene, he watches for Claire from his window; Rylance’s face becomes that of a hopeful little boy. His performance is fearless; I don’t think I’ve seen a lead man portrayed in this manner EVER in Hollywood!